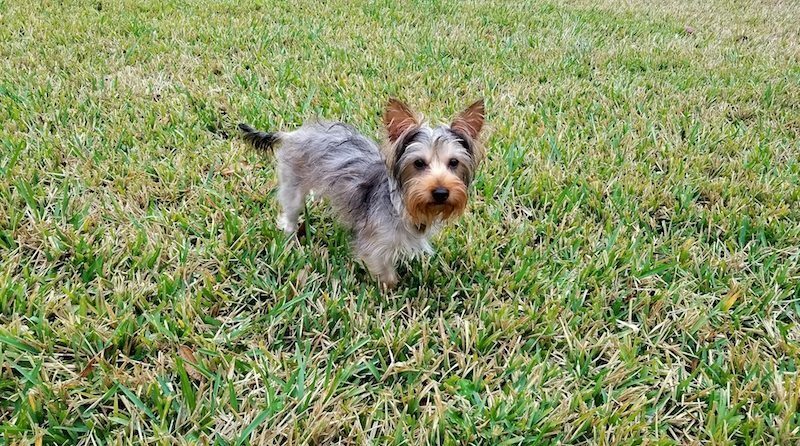 Please meet Maggie, a 6-7 month, 7 lb Yorkie puppy in need of a forever home. Maggie is a lap dog. Her favorite thing in the world is to sit on her person. She’s playful too though and loves toys. When she’s not snuggling, OK, let’s get real, this girl loves a swaddle, she is carrying a toy around in her mouth. She hails from Putnam County where someone was not giving her the care she needs. She arrived with lots of fleas and a great deal of fear due to ill-parenting, but she’s flea free, worm free and was spayed on Friday! And once she gets to know you, she’s a total powder puff. Her foster parents are pretty protective of her and want to make sure she finds the perfect forever home. Who is the ideal owner? Empty nesters or someone who has had small dogs before. She has a good bit of stranger danger which she’s working on, so little children wouldn’t be good. She’s working on her potty training, and she doesn’t get up at night. Her new owner needs to be committed and to understand that it’ll take her a few days to settle in, but she will make a WONDERFUL pet. She also loves cats. She has had her rabies, DHHP — due for a booster in 2 weeks. And she’s recovering from her neutering procedure. Maggie has a $300 adoption fee that goes to SAFE Pet Rescue. Vet references and an in-person interview are required. She has a picky foster mom (aka me). If you or someone you know is interested please call 904-314-5188.